Cars were flipped and set ablaze, smoke bombs were launched and tri-colour flags waved in defiance as heavily armoured police fought back in a bid to keep control of the city streets. The rioting has spread across Europe to Brussels and Amsterdam as Belgium and Dutch police brace themselves to tackle more violent demonstrations. Security officials imposed a lockdown on parts of central Paris, determined to prevent a repeat of the rioting a week ago that damaged a major monument, injured 130 people and tarnished the country's global image. 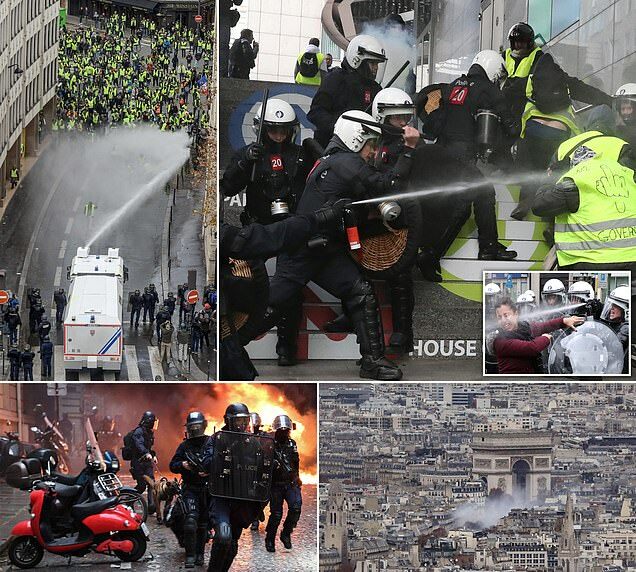 Blue armored vehicles rumbled across cobblestone streets from the Arc de Triomphe across toward eastern Paris as scattered demonstrations spread around the city. Police were mounted on horses and surrounded protesters with trained dogs. A ring of steel surrounded the Elysee Palace itself, as police stationed trucks and reinforced steel barriers in streets throughout the entire neighborhood.